Au-delà des images...: J'espère qu'elle l'aimera ! -- Hope she likes it! J'espère qu'elle l'aimera ! -- Hope she likes it! It's the 25th of the month, already, and time for our Magnolia licious Christimas All Year Long Blog Hop. If you came from NADYNE your are on the right track, if not, and wish to do the complete blogh hop, just click on the above metioned Magnolia-licious link. I had fun making this particular card! Tilda has a gift in her hand and hopes the friend she is offering it to will be pleased! She wants this to be a surprise, but can hardly hold her tongue! Look at her face, she has a question mark written righ across... Well I have been doing exactly the same thing as Tilda these days, preparing a treasure for a dear friend. If you look closely at the gorgeous background paper that gave the tone to my card, well, she offered it to me. I wanted to create a warm scene for Tilda, but I also wanted to add all the glitter that Christmas requires. I used, again, my old fashioned lace that I added to the glittery red ribbon. And, the die cut behind Tilda was made with my cricut! OH!!!! do I love this. Well, thank you for your visit and please, continue to see what the talented TANJA has come up with. C'est déjà le 25 septembre, journée de notre tournée Magnolia-Licious Christmas All year Long. Si vous arrivez de chez NADYNE, vous êtes sur la bonne route; si non, vous aimerez peut-être faire la tournée du début, dans ce cas, cliquez sur le lien Magnolia-Licious ci-haut. J'ai eu beaucoup de plaisir à réaliser cette carte! Tilda et moi sommes dans le même état d'âme! Elle a préparé une surprise pour une amie, et espère qu'elle lui plaira. Elle peine à garder le secret, tant elle a hâte d'offrir son cadeau; elle a le visage en point d'interrogation! Bien c'est ainsi que je me sens! Je prépare un petit trésor pour une chère amie, et j'espère qu'elle aura autant de plaisir à déballer que j'en ai eu lorsque j'ai reçu son paquet. Il contenait, entre autres, le très joli papier qui donne le ton à ma carte. Je voulais créer une scène chaleureurse et un peu antique pour Tilda, mais avec tout le glamour que Noël exige. J'ai créé la superbe découpe derrière Tilda avec ma cricut! OH! je commence à aimer beaucoup... J'ai aussi utilisé à nouveau la dentelle antique derrière le ruban rouge. J'espère que mon travail vous a inspiré. Merci d'être venue me visiter et s'il-vous-plaît, prenez le temps d'aller faire un tour chez la talentueuse TANJA. 7 Kids College Fund challenge No. 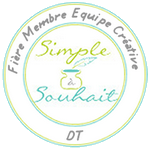 4, Sketch maganifique de Suzanne J. Dean. Ruban, dentelle, fleur, feuille et déco de mon inventaire. Ribbon, lace, flower, leaf, and deco from my stash. Gorgeous card. Love the background. What a gorgeous card! I love the glittery ribbon. Danielle, your Christmas card is simply gorgeous. The background is stunning and this adorable Tilda is colored to perfection. I love the way you colored her hair....actually, you really did an expert job coloring this image. Love the glitter!! oh Danielle, THIS IS TUNNING!! Your coloring is WOWSERS!!! Beautiful..
WOW! Danielle, this card is just amazing! I love your background - wowzers, it's so stunning! Your coloring is so, so pretty, honestly you've created so much depth! A magnificent work of heart here! Beautiful! I love the way you have Tilda colored, and the accent piece behind her! Nicely done!!! Lovely card!! I really like the colors you've picked for it, they are so rich!! And got to love the glitter!!! Gorgeous card and stunning background! Very nicely done I love the papers and your coloring is just awesome. Fancy and classy coloring Danielle!! 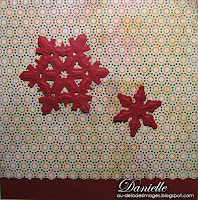 Lovely colored Tilda and this card is so gorgeous! 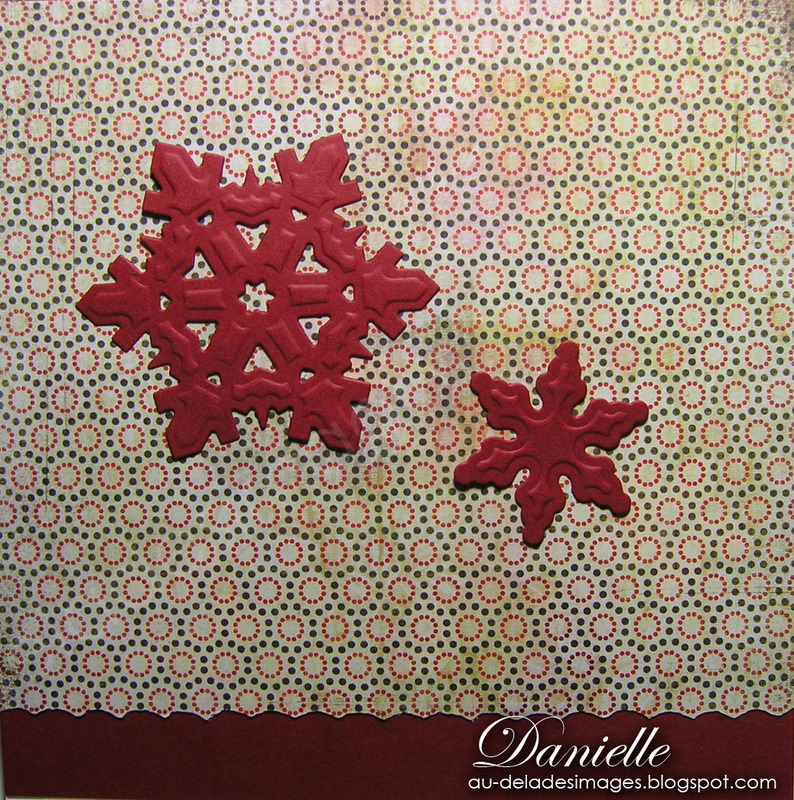 Beautiful card, Danielle! Love the red and gold and Tilda is so pretty!!! Gorgeous! Comment ne pas aimer? Tout est joli et harmonieux! Bien réussie Danielle, ta carte est superbe. J'aime beaucoup l'embossage avec le Utee et ton choix de papier. J'aime tout, tout , tout de cette carte! Je n'ai pas de mot pour la décrire! Elle est tout à fait sublime! Je l'adore! 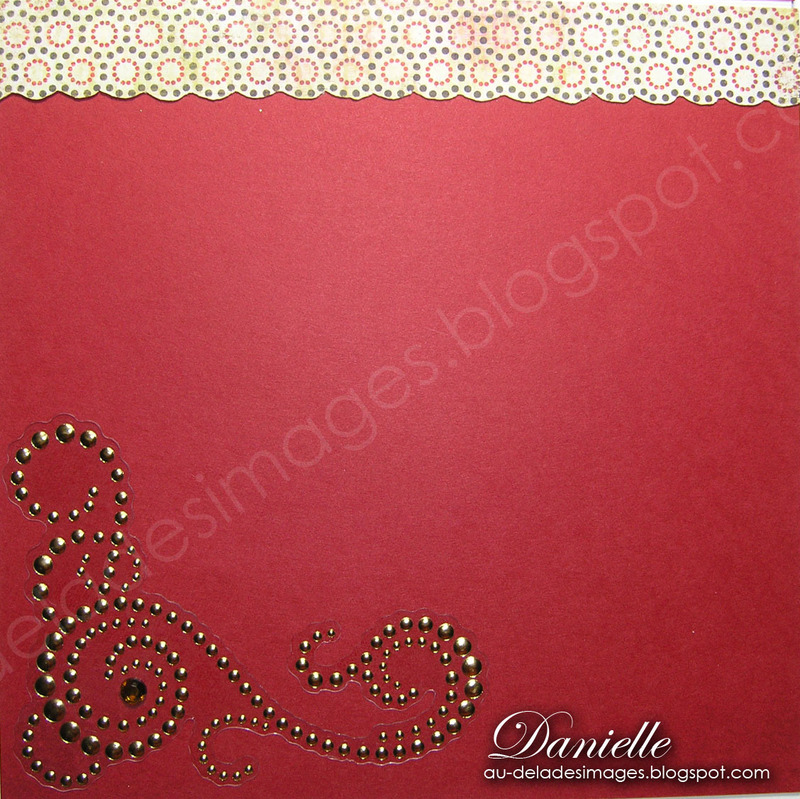 Gorgeous card Danielle! I love the background paper,and Tilda is colored beautifully! Thanks for joining the Magnolia-licious Blog Hop! A most beautiful Christmas Card!! Love the red and gold. Your background paper is awesome. She's a beauty Danielle! Love the papers and diecuts too! Terrific work!!! 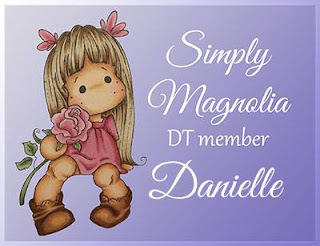 Hello Danielle, This card has left me in AWE!!! Yayyy...I made it in this time around. Hi Danielle. Love your utterly gorgeous card. Your papers are delish. Love the colours and your beautiful colouring of Tilda. Your die-cut shape behind Tilda is wonderful, so are your snowflakes. Wow Danielle! Stunning card! Gorgeous background and as always your coloring is fantastic! Oh Danielle, how absolutely stunning! I love the enameled embellie surrounding Tilda - another gorgeous masterpiece! So pretty! Thanks for joining us at the 7 Kids Challenge! What a gorgeous card. I love the rich colors of red and gold. beautifully colored. What an elegant card. Thanks so much for the kind words you left on my blog. you made my day. Wow, this is so gorgeous! The richness of the colors is beautiful and I love your coloring! Oh wow, what stunning colouring! 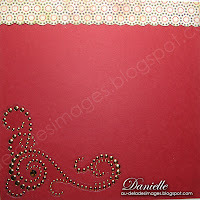 The glitter die-cut looks so luxurious and did you make the flower yourself? it's gorgeous!